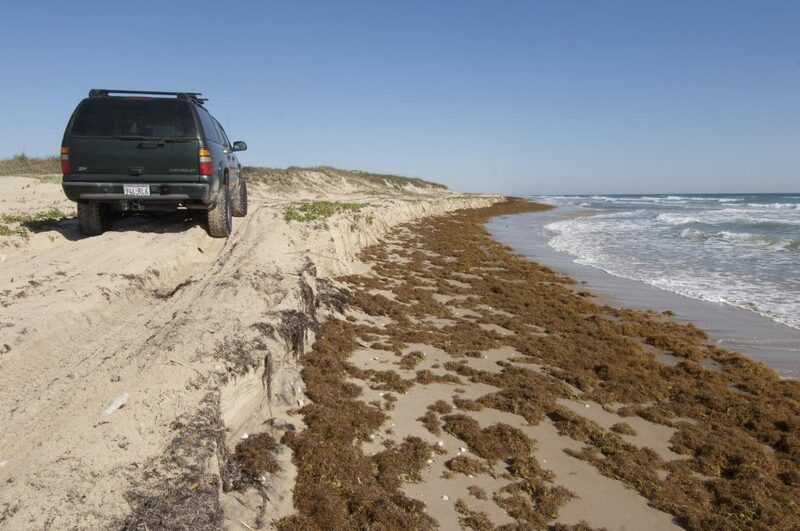 Sea level rise erosion, South Padre Island, about mile 20 up the four-wheel drive beach. This erosion is occurring during normal, non-storm tides when the sun and moon align to create the biggest tides of the year each spring (Spring Tides) and fall (King Tides). It’s not the averages that are troublesome. The understating reporting of scientists, journalists and climate science consensus organizations is one of the most confounding parts of climate change today. It’s the extremes that matter, yet extremes are viewed as “uncertainty” in a way almost entirely related to written grammar, rather than the statistical uncertainty of when, and how extreme, a certain impact will be related to statistics. A primary example comes from these recent findings on future sea level rise impacts from Princeton and Rutgers. The Intergovernmental Panel on Climate Change (IPCC) characterized sea level rise impacts the same for all events in their fifth report in 2013 and 2014. They did not state how often the much more extreme impacts would be occurring, because the science–as their consensus must report it– was not mature. The study finds that the extremes will happen 40 times more often on average by 2050. On average. In Seattle, the 500-year flood will happen about every 6 years. Along the U.S. southeast coast the 500-year flood will happen only about every 125 years, but the 100-year Flood will happen every 8 months. It’s not the average increase in flooding though. It’s the extremes that matter. One, 100-year weather event happening to any individual, community or infrastructure, is profoundly more important than that event not happening. It doesn’t matter whether it’s a 100-year flood, 100-year storm, 100-year drought, windstorm, blizzard, you name it. Rare events have outsized consequences. We could have a 50-year wind storm every day, and because generally our structures are built to withstand 50-year windstorms, there would be few consequences. But a 100-year storm is entirely different.Widespread damage and loss of life is in an entirely different class of events that is simply not comparable to less events. The 100-year flood in Galveston is 14 feet. The culture of climate reform has inured us to discussion of the consequences of extreme events. We take for granted that they will occur, but we do not realize the meaning of their impacts. If we did, undoubtedly, we would have acted by now to mitigate for the effects of climate pollution. The emerging field of global warming psychology helps us understand why our climate reform culture has developed in this grossly unbalanced way. The consensus organizations that publish reports that summarize climate science upon which policy is based consistently and grossly understate the effects of impacts because of the averaging effect of illustrating the entire body of science. This averaging does not include the outsized effects of extremes, but lumps everything together in an easily defendable “average,” or “normal” condition. In addition, professional reluctance to highlight extremes (what is known as scientific reticence (1)) adds an even greater distortion of actuality. By not emphasizing the outsized risk of extremes, only a tiny portion of impacts are captured in the consensus reporting and subsequent policy. This scientific and policy making behavior is ubiquitous across all disciplines, but with many areas of climate change and especially sea level rise, impacts are further masked by the inability of modeling to robustly address abrupt change. The global temperature then was very similar to today. It was an interglacial warm period between 100,000 year ice age pulses just like today. Except then, we were not pushing our climate with excess global warming gases at a rate that is arguably thousands of times faster than normal. In other words, evidence from 122,000 years ago did not indicate an abrupt change was taking place whereas today one is definitely taking place. The findings of this Xcaret work say that there is no other place that a sea level jump of this magnitude come come from except the collapse of the west antarctic ice sheet. So even though we have robust evidence of these abrupt changes, because we cannot model them, they are caveated out of the consensus organization reports and are not represented by policy. Right now, abrupt changes to the West Antarctic Ice Sheet, The Gulf Stream, the Amazon and high altitude and high latitude forest ecosystems are initiating. Simple logic says that unless we return warming to same amount less than it is now, these initiations will complete and what will ensue is irreversible, unrecoverable change. The challenges are outsized and never before experienced by our advanced civilization. Abrupt sea level rise of just 10 feet in the next 35 to 45 years as NOAA says will be released in modeling in the very near future, will so compromise both local and global infrastructures that our economy will be destroyed, because the sea level rise adaptation rate is 3 feet per century, and because once the abrupt ice sheet collapse mechanisms are allowed to complete their initiation (in 35 to 45 years), there will be no recovery. There is a lot more to this West Antarctic Collapse story at our in-depth article here that inlcudes 20 in-depth references with 32 citations. Of importance in closing. climate pollution reform policy must change. A generation ago when we began to try and implement emissions reductions, evidence of abrupt change was far less robust and modeling even less so. Now, because of delay, as much CO2 has been emitted as was emitted in the previous 230 years and the task of preserving a safe climate can only be preserved if new strategies are employed. Even 80 percent emissions reductions by 2050 (Paris Agreement) allow up to double to triple the warming we have already experienced. The solutions can be had for what we spend on advertising across the planet every year. But the momentum of the Climate Change Counter Movement is large. We have the technologies to preserve our climate and the costs will be as inconsequential as what we spend on advertising across the planet every year. But we can only succeed if we all get involved. and it really doesn’t matter what we do to get involved. The point is that not enough of us understand the consequences. If we all just talk about it more, those consequences will become easier to understand. Buchanan, Openheimer and Kopp, Amplification of flood frequencies with local sea level rise and emerging flood regimes, Environmental Research Letters, June 7, 2017_2017. Stanley et al., Antarctic ice sheet melting in the Southeast Pacific , Geophysical Research Letters, May 1, 1996, last Sentence of abstract. Jerger, RIMS 2016: Sea Level Rise Will Be Worse and Come Sooner, Insurance Journal, April 12, 2016. ClimateCrocks.com, Peter Sinclair, Caution: New Sea Level Story May be a Step too Far, April 21, 2016. IPCC 2013, Physical Science Basis, Chapter 5, Coastal Systems and Low-lying Areas, Adaptation opportunities, Constraints and Limits, Page 393, paragraph 10. 40 mm per year… Deschamps et al., Ice-sheet collapse and sea-level rise at the Bolling warming 14,600 years ago, Nature, March 29, 2012. 20 feet… O’Leary – Australia, The authors say 6m (20 feet) of sea level rise at 120,000 year before present in 1,000 years. Their data show a few hundred years. Oleary et al., Ice sheet collapse following a prolonged period of stable sea level during the last interglacial, Nature Geoscience, July 28, 2013. 20 to 29 feet… Sea level in recent interglacials with the Eemian, MIS 5e (~129,000 to 116,000 years ago) experiencing sea level rise of 6 to 9 meters above today and a global temperature a few degrees C above today. During MIS 11 (Mid Pleistocene, ~424,000 to 395,000 years ago) there was 6 to 13 m of sea level rise and the temperature was about the same as today. Dutton et al., Sea-level rise due to polar ice-sheet mass loss during warm periods, Science, July 10, 2015. Hearty, MIS 11 rocks! The “smoking gun” of a catastrophic +20 m eustatic sea-level rise, Pages, April 2007. Blanchon, et al., Rapid sea level rise and reef back stepping at the close of the last interglacial highstand, Nature, April 2009. Direct Air Capture (DAC) of Carbon Dioxide—Whose Science is Correct? Reports of new DAC technologies in the 2000s gave hope for a silver bullet for climate pollution. Estimates of costs on the order $20 per ton were made based on lab experiments and small scale projects. In 2011, two reports surfaced, one from the American Physical Society (APS) and the other from Massachusetts Institute of Technology (MIT). Both declared the physics behind the promising research was impossible and that costs would be $600 to $1,000 per ton or more. Because of the plausibility of a simple solution to climate pollution, these reports were widely repeated in the media. What did not make the media however, were subsequent rebuttals that showed the two negative reports only evaluated mature, WWII Era carbon capture techniques and both made fundamental errors in physics. The rebuttals used the incorrect APS and MIT work to show that the former promising research was valid. Global Thermostat Full Scale Pilot Project: $10 per ton with waste heat… The important aspect to understand about the Global Thermostat project is that energy is the largest component of DAC and these studies used $0.07 to $0.20 per kWh, whereas today solar power is at $0.03 per kWh and continuing to fall rapidly. Global Thermostat Graciela Chichilnisky Presentation, slide 7, $10 per ton. Direct air capture (DAC) costs… Goeppert et al., produced a literature summary of current DAC findings in 2012. It is important to note that considerable false propaganda has been circulated in the media about the infeasibility of DAC based on a report by the American Physical Society. Discussion of this apparent controversy is given below highlights of Geoppert 2012. APS research revealed as significantly incomplete by Nature… Socolow 2011 evaluated existing WWII Era atmospheric removal techniques and not surprisingly found them economically infeasible to address climate pollution. New technologies were not evaluated. The media widely circulated the APS study and even though the third most important scientific journal in the world refuted APS claims—because they did not evaluate current new technologies—the damage was done; the media cycle has run its course. Today DAC is almost completely discredited in climate pollution mitigation strategies considered by policy makers and advocates, regardless of academic findings counter to this understanding. Socolow et al., Direct Air Capture of CO2 with Chemicals, The American Physical Society, June 2011. Van Norden, Sucking carbon dioxide from air too costly, say physicists, Nature, May 11, 2011. Evaluates only mature technologies… House et al., economic and energetic analysis of capturing CO2 from ambient air, PNAS, September 2011. Further rebuttal of APS and MIT… Holmes and Keith identifies short fallings of MIT and APS work calling out different design choices, insufficient optimization and use of higher cost processes. When new DAC technologies are evaluated, costs are at or below those of mature DAC removal technology. Holmes and Keith, An air-liquid contactor for large-scale capture of CO2 from air, Philosophical transactions of the Royal Society A, 370, 4380-4403, 2012. Flawed analysis of the Basic physics of enthalpy… These researchers point out a fundamental flaw in the work of APS and MIT showing direct air capture takes more energy than flue capture because of CO2 concentration: “The notion of minimum work does not apply to the capture of CO2, because the capture process is exothermic.” When CO2 is reacted with something to remove it from air or flue gas, the reaction creates heat, “is exothermic.” So instead of 400 kJ or work per mole CO2 energy required the actual energy required involves moving air over whatever process is used to remove the CO2 from the air. This is 6 kJ per mole CO2. This relationship of the actual costs of removal of CO2 from the atmosphere being 1.5 percent of the costs suggested by APS and MIT corresponds very well to the costs assumed by research evaluating new technologies of +/- $20 per ton. It is important to note that the cost of regenerating the chemicals used to capture the CO2, whether for flue gas or atmospheric capture, is identical. Realff and Eisenberger, Flawed analysis of the possibility of air capture, June 19, 2012.